I have had a fantastic big kick off to the new year with a win for my African Trio set of cards this week at Crafty Cardmakers (with a Joanna Sheen prize on the way….love her stamps! ), I have just passed my first 12 months of blogging ( and a HUGE year it has been….I have absolutely loved every minute of it! ), I posted away a prize card to Sparkly Fairy for being amongst my first 50 followers ( my first ever giveaway) and Shantril and Wanda have joined my blog! Welcome. And the fun continues at Fashionable Stamping Challenges! and don’t forget to check out the inspirational projects from all the DT members. Stunning! At the Melbourne Zoo they have a butterfly enclosure where when you enter you are immediately surrounded by butterflies of hundreds of different species and you stand there in awe and surrounded and by nature for ages!!! I wanted to create an abundance of butterflies that were also colourful and overwhelming…so I have come up with the illusion of hundreds of butterflies bursting through the darkness into the light ~ with the children watching on in awe! The main stamp set that I have used is an unnamed clear set of butterflies~ I used 5 of the butterflies, many times….lol. And each individual butterfly also stands alone and is highlighted with glossy accents. Also Fern Leaf by Lucy’s Stamps and CI 277 (the girls). Oh WOW, I love this, Dot!!! And it sounds amazing to be surrounded by all those butterflies…so magical!! Oh wow Dot, your array of butterflies are outstanding, such beautiful colours, shapes and sizes. You have re-created your story perfectly and I can imagine myself being there. A great feeling. A riot of fabulous colours. You can almost feel those butterflies fluttering around you as you gaze at this. Wow, these colors rock, you've created a wonderful card full of spring feeling. Another WOW, here! From that alluring background in black and white to the most beautifully colored butterflies, it truly gives a feeling that you can reach out and touch one! Amazing! Happy Sunday! 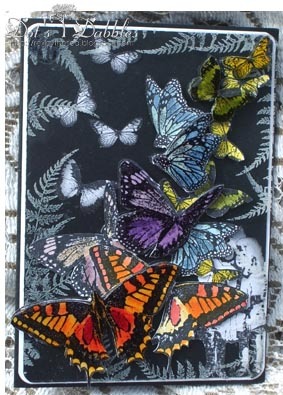 Stunning card Dot, Your buterflies look so real, and the colours are really beautiful against your background. Magnificient!!!! Thanks for sharing in Let’s Ink It Up’s *Anything Goes* challenge and good luck ! LOVE your DT piece! Love the butterflies! Stunning piece, I love your butterflies, they look ready to fly away. You deserved your prize and thanks for the lovely comment on my blog. I love your butterfly card as much as your African cards. What beautiful vibrant butterflies! Thank you for sharing your card with us at Crafty Cardmakers. What a beauty! The colors are so pretty. This is so beautiful ! Love your butterflies – they are amazing!!! Also wanted to say; Thanks so much for your support yesterday – your kind words about me joining the Lily Pad cards team really made my day. THANKS! Hi Dot, it's so long since I last came to visit that you must have been wondering where I was!!! Really sorry for the lack of comments on your stunning artwork, especially this beautiful butterfly extravaganza. I love butterflies and remember visiting a butterfly enclosure here a few years back. The colours and beauty will never fade in my memory. oh my word.. this is gorgeous! totally love all the colorful butterflies you put on top.. great effect!! !